The Sodium Lauryl Sulfate (SLS) is most commonly found in our every day using products like toothpaste, soaps, shampoos, shower gel, etc. These chemicals can damage the skin and hair if used regularly. So SLS free products are always welcome to all. Actually, these days everyone should go “No Poo” when it comes to shampoos. The silicones, sulfates, parabens, etc harm your hair and make your hair dry and damaged. So we have to aware of this before buying shampoo. 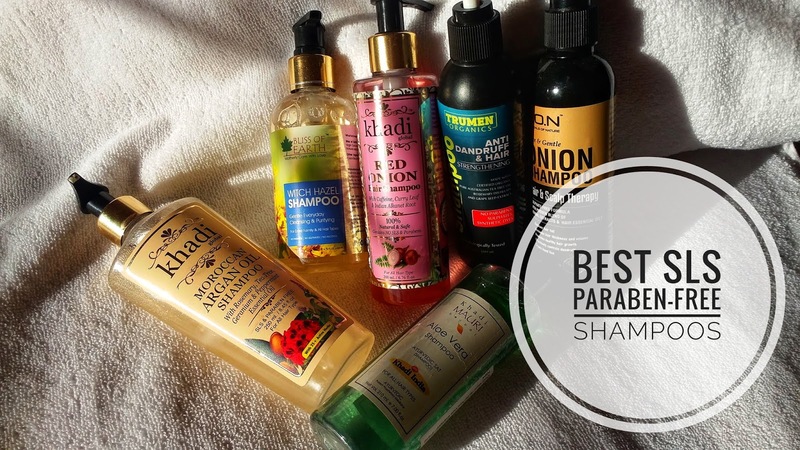 So in today's post, I'm listing on the best 6 SLS free shampoos that I have already tried and these are available in the online site. I'm suffering from hair problems like frizzy hair and dry hair problems for a long time and I'm also looking for a shampoo that I can use every alternative day to clean my scalp effectively. I was using many shampoos to get those benefits. I heard about the bliss of earth brands shampoo which is Alcohol-Free Witch Hazel Shampoo that sounds very promising for me and purchased from Amazon. handmade, cruelty-free and all-natural witch hazel shampoo. It is a handmade, cruelty-free and all-natural witch hazel shampoo that provide your hair with more strength. It also contains Organic Coconut oil, Organic Castor oil, and Extra Virgin Olive oil, so these natural oils keep your hair fortified and healthy. One benefit I love due to my frizzy hair, there is considerably less or no frizz at all when I used these. This is a shampoo for the entire family and my husband suffering from dandruff and just after two uses, he got dandruff free scalp and smooth hair. Definitely, It is a must try the shampoo. Onion is a natural source of quercetin and a powerful anti-oxidant that protects the health of our hair. It is also rich in sulphur, that with antiseptic, fungicidal and antibacterial properties that are important for encouraging healthy hair growth and stimulating blood flow. I love the fresh smell of this shampoo and its come in transparent color. The shampoo claims to be 100% natural and safe, without any SLS or parabens. It is made with all-natural ingredients like caffeine, red onion, alkanet root, and curry leaves, all of which are known to be great for hair. I used the shampoo after thorough oiling, so it did not leave my hair overly dry. I like the way the shampoo lathers and washes my hair effectively and does not dry out hair. It helps in making my hair really manageable without a conditioner. And it has been quite helpful in reducing the dullness of my hair and make them soft and shiny as well. Khadi Global Onion Shampoo also helps to control hair fall split ends and dandruff. I like that this shampoo claims to be mild enough for use on colored or hennaed hair. It is also suitable for all hair types. The product is also safe for daily use. This is my favorite shampoo and I'm really impressed with the after use result. It contains NO Sulfates, Parabens, Sodium Chloride, Gluten. If shampoos containing sulfates and other harmful ingredients can cause itchy scalp, serious skin irritation and disease, hair loss and damage, and the ability to create nitrate compounds which have been linked to cancer and cell damage. Khadi Global contains NONE of these harsh chemicals. It made with some amazing natural ingredients like Aloe Vera leaf juice, Glycerine, Soya Protein, White Willow Bark, Meadowfoam Seed Oil, Jojoba Oil, Avocado Oil, Dimethicone, Geranium essential oil, Peppermint Essential Oil, Cold Pressed Argan Oil, Cold Pressed Extra Virgin Olive Oil, Aqua, Bibhitaki, Manjishita Extract, Ratanjot Extract, Jatamansi Extract, Amla Extract Reetha and much more, these natural ingredients keep your hair fortified and healthy. It is a gentle and nourishing shampoo. The first thing that I love about this shampoo is the texture of the shampoo is pretty thin and smooth which spreads evenly and easily on the hair. I have very dry and frizzy hair and just after the first use, I have noticed that my hair really looks frizz free and smooth even without the conditioner. Also, it makes my rough and dry ends softer and smoother as compared to other shampoos. These effects stay for 4 to 5 days which is quite good. I absolutely love this result; it leaves my hair and scalp feeling really cleansed and soft. Khadi Mauri Herbal presents Aloe Vera Shampoo made using Ayurvedic formulation. It contains proteolytic enzymes which naturally stimulate hair growth and forms a protective layer over your hair that keeps it safe from environmental elements. If your scalp or hair is too dry or oily, Aloe Vera helps in restoring the right balance. I like this shampoo because I really adore the very lightweight and thin texture of it and it just looks like a pure aloe vera gel. It creates good leather and the fragrance is very nice it's the best one when it comes to aloe vera. After uses, I felt it makes my hair very soft silky and shiny. The Shampoo promotes hair shine and natural sheen of the hair. Even it helps in preventing dandruff. It is a very natural and safe shampoo for all hair types. This shampoo mainly designs for men. 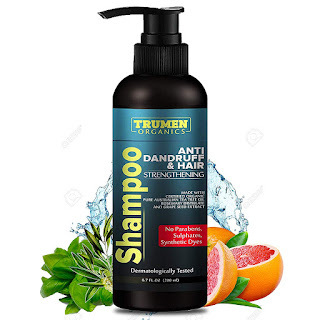 It's a pure anti-dandruff shampoo balance flaky scalp by gently cleansing to remove follicle-clogging dirt, oil, and dry skin for healthy hair growth and itchy scalp relief. It is a sulfate free paraben free cruelty-free and preservative free shampoo that designed for daily use. For best results, use at least twice a week or as directed by an expert. Essentials of Nature Onion Hair Shampoo is a very gentle shampoo which is enriched with proven herbal extracts and oils that help in controlling hair loss and promoting healthy hair growth. This mild and gentle hair shampoo is cleansing the hair without the uses of harsh sulphates and chemicals that damage the hair. After every uses I really liked it, hair feels soft and supple. It also promotes healthy hair and increases hair thickness and density.I am quite happy with the texture, and it effectively clean my hair and scalp. The best part of this shampoo, it is a 100% natural and free from harsh sulphates and chemical. I hope You all like this post and What is your favorite shampoo from these options? Let me know in the comments below.